Use with any UV or LED curable Product! 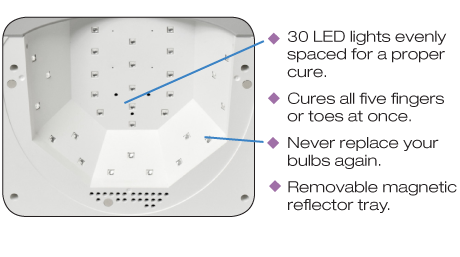 The Dual Cure Lamp technology allows the user to choose between a UV or LED cure. 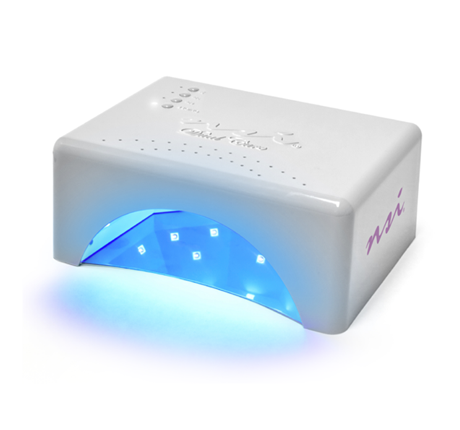 The flexibility allows the nail technician to use the UV and LED products they love without purchasing multiple lamps. The lamp is auto set to 90 seconds for UV products! Easily cure UV products in a flash with the default 90 second cure time. No need to select a cure time, the lamp will start at 120 seconds when the client places their hand in thelamp. The Dual Cure lamp is specifically engineered to improve the photo active consistency, resulting in a consistent depth of cure and superior photo penetration. This technology is unique! Designed for the nail tech, inside and out! The Dual Cure lamp is a lightweight but durable lamp, withstanding over 50,000 salon hours of use. The stylish cube shape is user-friendly and takes up minimal space on a Nail Station. I am thrilled. I still use NSI Permanente Gloss, what I have left that is. I’m sad they discontinued that. That being said, to have 2 different lamps for UV and LED consumes too much space. I have used this for the 2 minute cure time for my PermaGloss clients. I love that all they gave to do is insert their hand and it automatically turns on the UV lamp. So far so good as well for the LED portion of the lamp. I could not be happier! It is lite as a feather, seemingly, the low profile is wonderful as well ;). Thank you so much. There may be other dual lamps out there, but I trust NSI so much that I would rather pay a few extra dollars to have theirs. I love being able to eliminate a uv lamp from my table! Very light. Low profile, small but perfect size to fit a full hand. cures beautifully. I like the fact it automatically turns on but I hear some other lamps turn off easily if a client moves a finger but this one is good at detecting the hand is still inside and won’t turn off, and restart your lamps timer. Removable metal plate is great for doing gel on feet. No beeper when it turns off which keeps the service quiet and relaxing for my clients. You can slightly feel it cool as the lights go off so clients know easily when their hand can come out. Love this lamp! Cures perfectly every time. The timer saves so much time not having to guess when it is done. would highly recommend. 3. Set the timer individually through 5s, 30s, or 60s button and the light will start automatically. 2. Press ON/OFF Button and place hands into the lamp. 3. Infrared sensors will automatically start and cure for 2 Minutes. 4. Cure the UV products according to UV cure times.